A demo believed to be the first recording of David Bowie's hit song Starman is being put up for auction. 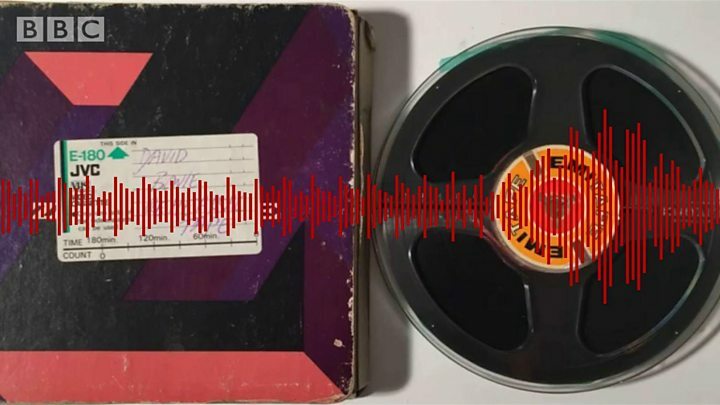 The 1971 tape had been packed away in a box and "totally forgotten about" for almost 50 years. Bowie can be heard on the demo telling guitarist Mick Ronson he had not finished the song when he tried to end the recording. Ronson gave the demo to his friend Kevin Hutchinson, an aspiring musician, to help him learn the song in 1971. But Mr Hutchinson listened to the song, labelled it "David Bowie rehearsal tape" and packed it away in his loft. The demo also contains recordings of Bowie songs Moonage Daydream and Hang Onto Yourself. "At 16, you're not totally impressed. Nothing impresses you." He kept the tape despite moving house several times and now Mr Hutchinson thinks it's "phenomenal... obviously". The song featured in the 1972 Ziggy Stardust concept album, which propelled Bowie to fame. The demo will be auctioned on Tuesday at Omega Auctions in Newton-le-Willows, between Liverpool and Manchester, where it is expected to sell for £10,000. Mr Hutchinson retrieved the tape from his loft after watching a documentary about Bowie, who died aged 69 in 2016. He told BBC Radio Humberside in 2017 that he had forgotten about the tape and was "staggered" when he heard the quality of it. Mr Hutchinson said his wife Claire had prompted his memory after remembering his story about Ronson. He said: "I think she thought I didn't have the tape because when you say to someone, 'I once did some stuff with Mick Ronson and with David Bowie, people think, 'Yeah tell me another one.'" He said he "couldn't believe it" when he found and played it, describing the recording as "superb". "You can tell that Mick has never heard the song before because at the end he is just about to turn the tape recorder off and Bowie says, 'Hang on. There's a little bit more," Mr Hutchinson said. Dan Hampson, assistant auction manager at Omega Auctions, said the tape was "possibly the first ever demo version of Starman". "There's a lot of Bowie mythology around the writing of this timeless classic, and the raw and truly beautiful version heard here helps to provide a fascinating insight into the creative process of a bona fide genius," he added.